Traditional liferaft for cruising. Manufactured in compliance with ISO 9650. The Viking RescYou™ liferafts for yachting provide double security for passengers as they are equipped with two individual buoyancy chambers, each having sufficient buoyancy to carry the weight of the number of persons which the liferaft is designed to accommodate. Made from a special natural rubber fabric. Delivered in nylon valise. Ballast system with 4 bags containing 60 litres/16 gallon per bag. Dimensions: 80 x 37 x 35 cm; Weight (with equipment): 28 kg. This particular liferaft for yachting provides double security for passengers as they are equipped with two individual buoyancy chambers, each having sufficient buoyancy to carry the weight of the number of persons which the liferaft is designed to accommodate. Made from a special natural rubber fabric. Delivered in rigid glass-fibre reinforced polyester container. Top of the line self-righting liferaft. Manufactured in compliance with ISO 9650. Dimensions: 80 x 57 x 32 cm; Weight (with equipment): 42 kg. This particular liferaft for yachting provides double security for passengers as they are equipped with two individual buoyancy chambers, each having sufficient buoyancy to carry the weight of the number of persons which the liferaft is designed to accommodate. Made from a special natural rubber fabric. Delivered in nylon valise. Top of the line self-righting liferaft. Manufactured in compliance with ISO 9650. Dimensions: 82 x 47 x 36 cm; Weight (with equipment): 33 kg. 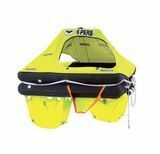 This particular liferaft is manufactured in compliance with ISO 9650-2. Delivered with an ISO 9650-2 Coastal emergency pack and packed in either a compact high gloss fibre container or a water resistant valise. 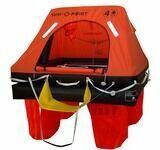 The Viking RescYou Coastal liferaft is designed for coastal sailing near rescue points. Features include: ISO 9650-2 certified; Lightweight; Boarding ramp for easy access; Made from a special natural rubber fabric. Two individual buoyancy chambers each having sufficient buoyancy to carry the weight of the number of persons which the liferaft is designed to accommodate. Highly visible fluorescent yellow canopy. Automatically inflating canopy. Ballast system with 4 bags containing each 60 litres/16 gallons per bag. Two storage pockets. Two openings for ventilation and visibility.Stored in a compact high gloss fibre glass container. Delivered with standard coastal emergency pack covering basic needs for coastal sailing. 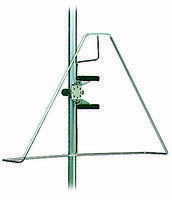 Dimensions: 75 x 45 x 30 cm; Weight (with equipment): 30 kg. 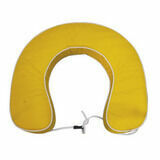 This particular liferaft is manufactured in compliance with ISO 9650-2. Delivered with an ISO 9650-2 Coastal emergency pack and packed in either a compact high gloss fibre container or a water resistant valise. 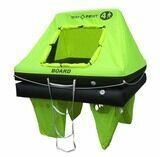 The Viking RescYou Coastal liferaft is designed for coastal sailing near rescue points. Features include: ISO 9650-2 certified; Lightweight; Boarding ramp for easy access; Made from a special natural rubber fabric. Two individual buoyancy chambers each having sufficient buoyancy to carry the weight of the number of persons which the liferaft is designed to accommodate. Highly visible fluorescent yellow canopy. Automatically inflating canopy. Ballast system with 4 bags containing each 60 litres/16 gallons per bag. Two storage pockets. Two openings for ventilation and visibility.Stored in a compact handy water resistant valise. Delivered with standard coastal emergency pack covering basic needs for coastal sailing. Dimensions: 79 x 37 x 37 cm; Weight (with equipment): 25 kg. This particular liferaft for yachting provides double security for passengers as they are equipped with two individual buoyancy chambers, each having sufficient buoyancy to carry the weight of the number of persons which the liferaft is designed to accommodate. Made from a special natural rubber fabric. Delivered in rigid glass-fibre reinforced polyester container. Top of the line self-righting liferaft. Manufactured in compliance with ISO 9650. Dimensions: 80 x 57 x 35 cm; Weight (with equipment): 48 kg. This particular liferaft for yachting provides double security for passengers as they are equipped with two individual buoyancy chambers, each having sufficient buoyancy to carry the weight of the number of persons which the liferaft is designed to accommodate. Made from a special natural rubber fabric. Delivered in nylon valise. Top of the line self-righting liferaft. Manufactured in compliance with ISO 9650. Dimensions: 83 x 47 x 38 cm; Weight (with equipment): 38 kg. This particular liferaft for yachting provides double security for passengers as they are equipped with two individual buoyancy chambers, each having sufficient buoyancy to carry the weight of the number of persons which the liferaft is designed to accommodate. Made from a special natural rubber fabric. Delivered in rigid glass-fibre reinforced polyester container. Top of the line self-righting liferaft. Manufactured in compliance with ISO 9650. Dimensions: 80 x 57 x 32 cm; Weight (with equipment): 53 kg. The ISO 9650-1 Commercial liferaft is a robust liferaft that has been designed to comply with the strict ISO 9650-1 Group A regulations for 24-hrs with the addition of extra equipment. It also meets the MCA code of practice and is fully tested to the ISO 9650-1 A specifications. Natural rubber fabric, which is Solas approved. Twin independent large diameter tubes with a high arch that increases interior volume and is fitted with a thermal floor. A very useful addition is the boarding step with a two step ladder. There is also a grab handle midway leading into the hand ladder inside the main body. Dimensions: 69 x 52 x 25 cm; Weight: 27 kg; Comes in handy container. The ISO 9650-1 Commercial liferaft is a robust liferaft that has been designed to comply with the strict ISO 9650-1 Group A regulations for 24hrs with the addition of extra equipment. It also meets the MCA code of practice and is fully tested to the ISO 9650-1 A specifications. Natural rubber fabric, which is Solas approved. Twin independent large diameter tubes with a high arch that increases interior volume and is fitted with a thermal floor. A very useful addition is the boarding step with a two step ladder. There is also a grab handle midway leading into the hand ladder inside the main body. Dimensions: 75 x 56 x 28 cm; Weight: 32 kg; Comes in handy container. The Waypoint Coastal is the answer to the safety of boaters who do not venture far Offshore, but it is equally safe as our other models. All the parts are of the highest quality and comply to the Commercial MED / SOLAS standard. It is constructed with 2 independent tubes, and the canopy is self erecting. The bright Fluorescent yellow self erecting canopy has a large entrance to facilitate boarding even for larger persons with all their wet gear on and can easily be spotted out at sea. ISO 9650-3 sertified. Packed dimensions: 60 x 40 x 23 cm; Weight: 18 kg; Comes in handy carrying case. The Waypoint Coastal is the answer to the safety of boaters who do not venture far Offshore, but it is equally safe as our other models. All the parts are of the highest quality and comply to the Commercial MED / SOLAS standard. It is constructed with 2 independent tubes, and the canopy is self erecting. The bright Fluorescent yellow self erecting canopy has a large entrance to facilitate boarding even for larger persons with all their wet gear on and can easily be spotted out at sea. ISO 9650-3 sertified. Packed dimensions: 60 x 40 x 23 cm; Weight: 20 kg; Comes in handy carrying case. The Waypoint Coastal is the answer to the safety of boaters who do not venture far Offshore, but it is equally safe as our other models. 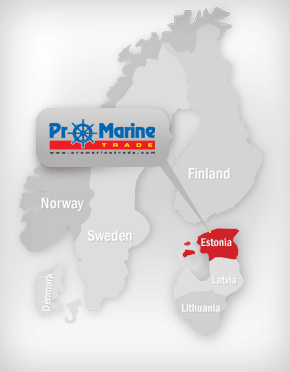 All the parts are of the highest quality and comply to the Commercial MED / SOLAS standard. It is constructed with 2 independent tubes, and the canopy is self erecting. The bright Fluorescent yellow self erecting canopy has a large entrance to facilitate boarding even for larger persons with all their wet gear on and can easily be spotted out at sea. ISO 9650-3 sertified. Packed dimensions: 65 x 45 x 26 cm; Weight: 25 kg; Comes in handy carrying case. The Waypoint Coastal is the answer to the safety of boaters who do not venture far Offshore, but it is equally safe as our other models. All the parts are of the highest quality and comply to the Commercial MED / SOLAS standard. It is constructed with 2 independent tubes, and the canopy is self erecting. The bright Fluorescent yellow self erecting canopy has a large entrance to facilitate boarding even for larger persons with all their wet gear on and can easily be spotted out at sea. ISO 9650-3 sertified. Packed dimensions: 60 x 42 x 24 cm; Weight: 20 kg; Comes in handy container. The Waypoint Coastal is the answer to the safety of boaters who do not venture far Offshore, but it is equally safe as our other models. All the parts are of the highest quality and comply to the Commercial MED / SOLAS standard. It is constructed with 2 independent tubes, and the canopy is self erecting. The bright Fluorescent yellow self erecting canopy has a large entrance to facilitate boarding even for larger persons with all their wet gear on and can easily be spotted out at sea. ISO 9650-3 sertified. Packed dimensions: 66 x 45 x 29 cm; Weight: 24 kg; Comes in handy container. 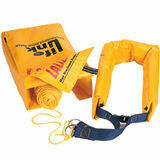 MOB rescue system is designed to be permanently mounted to the pushpit in its own soft, easy clean PVC bag. The kit contains 50 m of floating line attached to a sturdy buoyant PVC life-sling and a personal retaining clip for added safety. 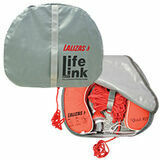 The Lalizas life-link Man-Overboard Rescue system is designed to be permanently mounted to the pushpit in it is own soft, easy clean PVC bag. The kit contains 50 m of floating line attached to a sturdy buoyant PVC life-sling and a personal retaining clip for added safety. Deployment is achieved by removing the life-link, attaching the floating line to a secure point and throwing astern. Once in the water the boat should circle the casualty allowing the life-link to be towed to their aid. Rescue is completed when the casualty is safely clipped into the life-link, winched to the boat and hauled on board. Silver cover, horseshoe lifebuoy, floating light and 30 m of floating retrieval line. Coated fabric storage bag, UV-rays resistant, supplied with clips for being fixed on a pulpit. Container provides protection and easy-to-spot horseshoe buoys by beaches, lakes, rivers or jetties. 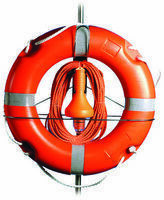 Horseshoe lifebuoy complete floating flashing light with 30 m of floating Levyline. Closed in a special PVC/polyester fabric bag. Rail mounting with adjustable straps. 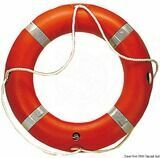 Horseshoe lifebuoy supplied with accessories. Lifebuoy (Osculati product codes: 22.420.00) + danbuoy (30.584.00) + rope (22.408.06) fitted onto a covering made of white ABS, designed to be hanged onto the pulpit or onto the wall. Quick opening, for pulpit mounting it requires 4 clamp models 37.175.81 or 37.261.01. Eltex orange SOLAS lifering, filled with expanded polyurethane. Reflective tape. Size: 42 x 72,5 cm. Weight: 2,5 kg. Eltex orange lifering, filled with expanded polyurethane. Reflective tapes. Size: 45 x 75 cm. Weight: 3 kg. Eltex orange lifering, filled with expanded polyurethane. Reflective tape. Size: 40 x 64 cm. Weight: 2,5 kg. 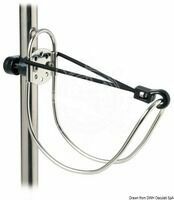 Bracket for lifering is made of mirror polished stainless steel, designed for wall mounting or for fitting onto the pushpit with special clamps. 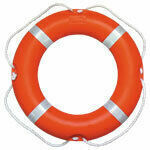 Can be supplied with lifebuoy, dan buoy and 30 m rope. Stainless steel buoy holding bracket. Universal model, can be mounted onto the deck, bulkhead or onto stainless steel pipes with diameter of 22/25 mm. Bracket made of stainless steel and includes dan buoy light rack.